In TURBOdesign1 - A new flexible parameterization approach has been developed and integrated in the existing Meridional Geometry Generator, which allows creation of arbitrary meridional geometries. The user can specify a number of sections and for each location define the width, orientation and location of the reference points used for rotation. For example, this meridional geometry parameterization can be used when optimizing mixed flow pumps and centrifugal compressors with return channels by making use of a small number of parameters (Figure 1). The implementation of this new meridional geometry method has been done in such a way as to make it fully available to TURBOdesign Optima and to TURBOdesign WB. This means that the M4 parameters controlling the meridional geometry will now be available within ANSYS Workbench when setting up a case with TURBOdesignWB. Fig 1. Meridional Geometry Generator showing the new M4 parameterization functionality being used to apply a rigid rotation to a return chananel. 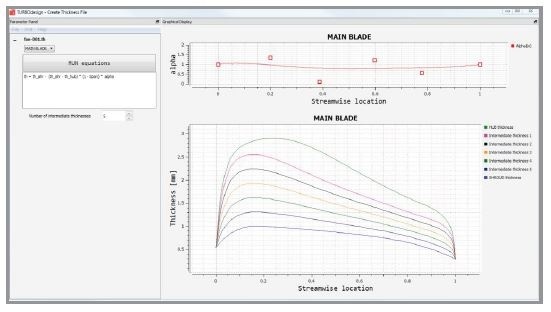 A new thickness distribution window has been developed to give more flexibility when defining the thickness distribution through equations. Another new feature introduced is the spanwise control which is defined graphically in the same thickness window via Bezier or Cubic splines (Figure 2). Fig 2. Thickness Distribution Window with streamwise and spanwise Control. In our 40 mins webinar - 'Introducing TURBOdesign Suite v6.4 for Turbomachinery Design and Optimization', we will show how the above and new features and enhancements in TURBOdesign Suite 6.4 enable turbomachinery engineers to link seamlessly to common CAE environments and to produce breakthrough high-performance designs faster than ever before. Learn what's new in TURBOdesign Suite 6.4. Discover how you can setup efficient multi-objective and multi-point optimizations using TURBOdesign Suite, delivering breakthrough designs. See how TURBOdesign Suite can seamlessly integrate with different CAE environments. We provide software and services for the design and optimization of turbomachinery, based on our unique 3D Inverse Design technology. Our tools and services help customers achieve innovative “breakthrough” designs, delivering market leading solutions at dramatically reduced development costs. ADT, headquartered in London, UK, was established in 1999 as a joint venture between University College London and The Ebara Research Co Limited of Japan. We are considered as one of the leading global turbomachinery design software providers, with our TURBOdesign Suite tool set in use across a very wide range of applications and sectors. Our design consultancy services deliver cutting-edge solutions to our global customers. Whether the task involves a complete solution, from concept to final design for manufacturing, or is facing challenging multi-point / multi-objective design optimization, we work closely with our customers and support them throughout the entire design process.